I have long been a fan of the GTD approach and have recently been rereading David Allen’s book on Getting Things Done. Indeed I bought 10 copies and passed them out to colleagues working on the OLnet project as I believe his ideas and methods can only help people. BUT in reading his book I have had some difficulty in getting the match between PROJECTS and ACTIONS. The focus is on action but unless these make sense in terms of projects then it is hard to get going and decide what to do. GTD offers good advice compressed into about a few pages (p62-p81 in my UK edition) yet somehow I could not make that advice stick or pass on the ideas to other people. Until the beginning of the summer when I came up with a variant: AVOID planning! 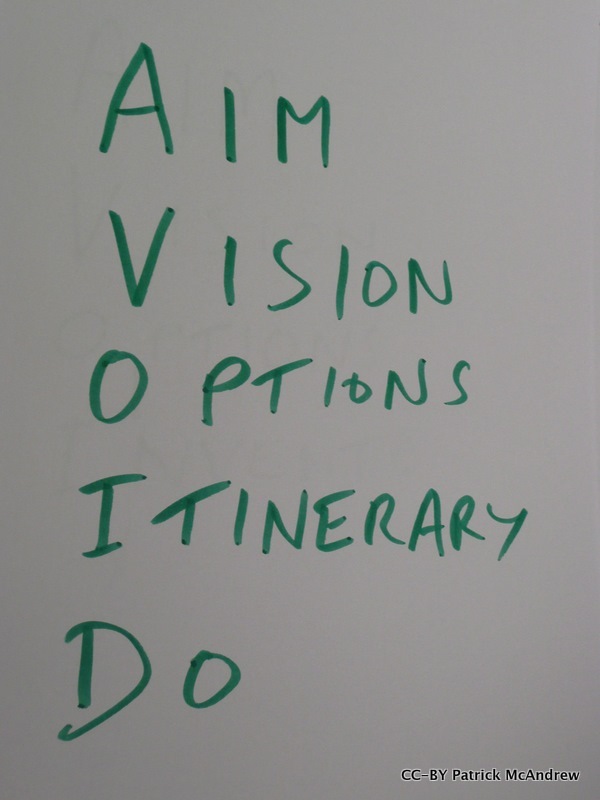 Notice the split between aims and vision. I have found that people are often asking for what is the vision behind a project – but then treating the result as if it was the guide to what has to be done. Splitting this into an aim and a separate vision has solved this dilemma for me. The AIM is then something that might be relatively straightforward such as to “write a blog post about the AVOID planning”. The aim should in general something you would be happy to be held to. In effect the promise you are making yourself that you can deliver on. The VISION is where you let yourself imagine the other side of success. In the vision think about impact and everything working out. So the vision might be “Blogging about AVOID planning helps those I work with to be more efficient and know what each other are doing and then it gets picked up as an approach for the unit, the university, the world … leading to a new role as an efficiency guru.” Visions, including this one :-), may contain aspects that you might not expect to achieve but if you miss spotting them may rein in what you do and the connections that can be made. OPTIONS is where ideas should flow. Gathering all the things that you might do. In this section remain in brainstorm mode without being too critical about the ideas generated. Options are optional so record each idea without thinking of them as commitments. So can have options such as “Make a Powerpoint presentation about AVOID/Put an animated podcast together with voiceover on YouTube/Blog onto my personal openpad site/Link the method to olnet.org/Run a session at the next team meeting/Write an AVOID planning book/….”. Finally DO. At the planning level too much effort can go on trying to get the list of things to do right and to be sure about the options that have been selected. Rather the DO section is really a hand over to however you track your actions. What does need to be identified is the Next Action level. A project without any Next Action is one that is not going anywhere. So again in my self-referencing example the Next Action was “Set a date to talk about AVOID” and now is “Draft a blog post about AVOID”. Now work your way down the list as quickly as is feasible. Write the commitment under AIM (you might find at first you need to list some alternatives and refine) then let your ambitions loose and write out all that might happen when you succeed under VISION. In independent brainstorming mode then fill in the OPTIONS. I find this can be quite liberating and make you realise that you have ideas that you need to get down before you let them go – even if you cannot see them as feasible or even necessarily good ideas. In this category for me are the ones that would be good if they happened but might cause everyone far too much work! But record it without being too critical. Then the ITINERARY pause – what is really pressing and has to be done soon. What is the eventual target. It is often the case that there is no real end date imposed in which case put in best guesses. This can also provide the section that is a checklist of progress. If there need to be visible outputs such as progress reports, final reports etc. then note here. Treat this section as grounding after the options section but do not over plan. Under DO it might be that there is not very much to record at this stage but there should be for yourself at least a clear Next thing to do. I find Toodledo a great help in running a GTD style ToDo list. Now that they have added notes it is also a good platform for organising projects and a home for AVOID plans. I won’t go into the details here but do advise signing up for a free account (following this link with note that I recommended you or just go direct). I think most of what I have written here can be found in David Allen’s GTD book. What I have done is pick out the section that matters when planning and also come up with the AVOID acronym. Whether this makes a difference for others I don’t know; it has helped me remember and adopt this five stage approach to planning and to bring a few others on board without just saying “read the book”! The GTD approach is to dump a whole list of everything that you need to do and that makes a great place to start. But where to make the dump? A couple of years ago I got on fairly well with a simple little note book; but then it got messy and I stopped. Then I tried the todo list on on an iPaq; but then I switched computers and it wouldn’t sync and I stopped. So this time around I started with the application that seems to be in favour for time management: Remember the milk . In RTM there are some good features: it embeds in iGoogle desktop, it is easy to use, there are ways to set the different contexts. But I think I might be too much the optimist when filling in the things to do with the result that each day’s todo list becomes dominated by the things I didn’t do on the previous days. I felt that I needed something to hold those items that I need to do after i have done something. So I looked around for something a little bit more sophisticated. What i have found is ThinkingRock. ThinkingRock seems to take the GTD approach more seriously than other pieces of software and act as a thought organiser rather than time organiser. I have been impressed by the way in which the software goes beyond the actions to include projects – i.e. things that take more than one action. After a few days I remain quite enthusiastic about ThinkingRock as a process gatherer: but it seems less good as a time schedular. I feel that someone out there has probably mashed this into Remember the milk but I can’t see it in a quick scan. It also sits as a main application rather than embedding into other things. But for the moment I think I will use it as my process gatherer. I now need to find a way to work my process scheduler: this should pick out what needs doing, give it a time slice, up the priority of things I ignore too long, and not be annoying. Mini-spec only as again this time-slice is used up. By the way following Tony’s advice now running RescueTime so at least I should start to know the applications I spend time using – though not sure if it will help me know why. Following up on my previous post about Life Thrash I have carried on thinking about the parallels between operating systems and life. The two suggestions so far “switch off and on again” and “upgrade to a newer model” are a bit tricky to implement – however a software upgrade does not seem out of the question! Sticking with process control in particular I feel that I am currently running a poor algorithm that loses processes, can fail to complete, and works best when simply just doing one thing (but not necessarily the right thing). In OS terms this is like an old version of DOS and things would be a whole lot better if I was running Unix. So what is a decent process management system. A quick Google for Unix process management shows that there are likely to be some good guides out there, and I may even see if I still have my lecture notes (in troff) on a CD somewhere, but for the moment I want to just describe it from memory so apologies if there are some mismatches here. Useful concepts are: processes, priorities, nice, running, sleeping, zombie, time slice. Each thing that can be run is a process, the priority is how much you would like it to run, nice is a way to lower (or raise) that priority. Processes can be running, sleeping waiting their turn to run, or a zombie which is something left around that can’t do anything anymore. Just had a check – I left out stopped, which I think is something that needs to be started again. The key then is to apply a decent algorithm that gives each process a turn, but while a process is having its turn the priority reduces so that no process will miss out for long. Swapping processes in and out switches the context and the OS will try to do this fast enough so multi-tasking appears to work even though the reality may well be that the machine only has one processor. OK well my time slice on this task is now up and I will switch to something else (sleeping). I hope that there is enough here to help me think about how actions in life can also be viewed as processes. I want to explore what can be done to help control these: process lists, contexts, priorities and time slices. I think the answer will look a lot like David Allen’s Getting Things Done and that will be good as that opens up some tools that can be used to help.